So first update: I’ve taken four vaccination injections, read the Financial Times/Goldman Sachs business book of the year ‘The World Is Flat’ about globalisation featuring Infosys and a few of us managed to meet up in London one evening thanks to glorious facebook! It was great to see everyone, find out about their summer holidays and start brainstorming ideas for what we can do in India. These include visiting the golden triangle of India and possibility of motorcycling. We shall see … . It was also nice to meet new recruits who have been hired after the induction day too. I’ll leave you with an Infosys presentation clip played to us during the induction day. 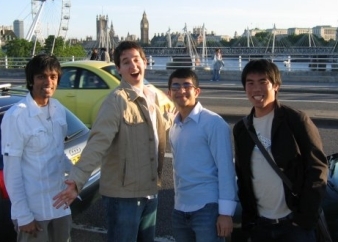 Photo: Jeetandra, Jon, Me, Fu on the Waterloo Bridge. This entry was posted on Monday, July 9th, 2007 at 7:20 pm	and is filed under Preparations. You can follow any responses to this entry through the RSS 2.0 feed. Both comments and pings are currently closed.